Summary: A newly discovered retinal cell may cause myopia when it dysfunctions, researchers report. Dysfunction of cell may be linked to amount of time a child spends indoors. The study will appear in the Feb. 20 print issue of Current Biology. It was published online Jan. 26. Image of a ON Delayed retinal ganglion cell colored by its depth in the retina. Arrowheads point out the unique “recursive” morphology of the dendrites that snake up and down. NeuroscienceNews.com image is credited to the researchers/Northwestern University. The study is part of Schwartz’s larger body of research to reverse engineer the retina by identifying new retinal cell types in mice. The retina has about 50 types of retinal ganglion cells, which together convey all the information we use to perceive the visual world. Each of these cells provides different visual information — such as color or motion — about any point in space. Image Source: NeuroscienceNews.com image is credited to the researchers/Northwestern University. Original Research: The study will appear in Current Biology. Northwestern University “Myopia Cells Discovered in Retina.” NeuroscienceNews. NeuroscienceNews, 6 February 2017. 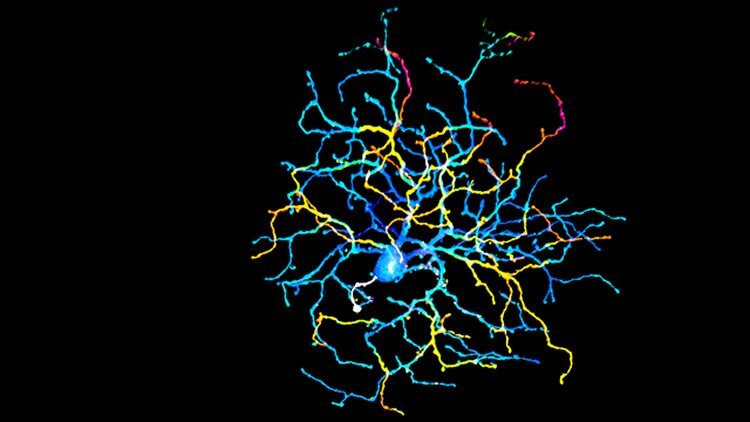 Northwestern University “Myopia Cells Discovered in Retina.” http://neurosciencenews.com/retina-myopia-cells-6069/ (accessed February 6, 2017).